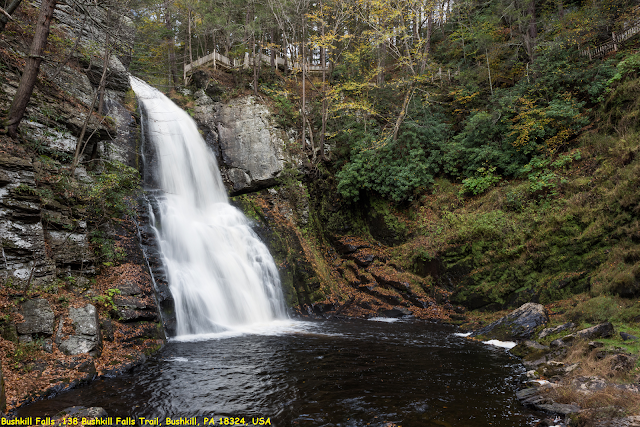 Bushkill Falls is a series of eight privately owned waterfalls, the tallest of which cascades over 100 feet (30 m), located in Northeast Pennsylvania's Pocono Mountains in the United States. Beginning at the headwaters of the Little Bushkill Creek, the water descends the mountain, toward the Delaware River, forming Bushkill Falls, Bridal Veil Falls, Bridesmaid Falls, Laurel Glen Falls, Pennell Falls, and three additional, unnamed falls. From the top of the first falls to the bottom of the lower gorge, the drop is about 300 feet. Other attractions include the Mining Maze, Mining for Gemstones, Native American and Wildlife exhibits, miniature golf, paddleboat rides, miles of nature trails, fishing in Twin Lakes, gift and souvenir shops, ice cream shop, fudge kitchen, snack bar and trail map adventures. Open daily from April through October/November weather permitting. Free parking and picnic area. There are four popular routes to choose from to see eight waterfalls....the green trail takes about 15 minutes and enables you to see the Main Falls from an overlook. Follow the yellow trail for top and bottom views of the Main Falls as well as the Lower Gorge Falls, Laurel Glen and Upper Canyon. To view the Pennell Falls follow the blue trail. The red trail is for avid hikers and takes you to the Bridal Veil Falls. About two miles long, you will see each of the eight waterfalls. Approximately 2 hours for the red trail.